Snow on Halloween? Popular belief is that we seem to have a lot of snow when the trick or treaters are out on the street. Conventional wisdom in the Denver area is that it always seems to rain or snow on Halloween. I know as a kid it seemed like Mother Nature always put a damper on our trick or treating. But, is there any truth to this urban legend? Or is this just one of those times where our memory doesn’t serve us quite right? This year it certainly looks like we have nothing to worry about but the National Weather Service has been kind enough to compile weather statistics just for Halloween. As it turns out, the thought of snow and rain on Octboer 31st isn’t just in our minds! 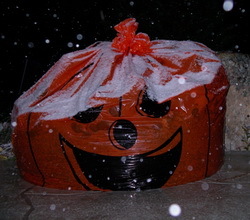 Click here to read all about Halloween and Denver’s historical chances of snow. This entry was posted on Thursday, October 30th, 2008 at 10:59am MDT and is filed under Climatology, Thornton Weather. You can follow any responses to this entry through the RSS 2.0 feed. You can skip to the end and leave a response. Pinging is currently not allowed.